The building that is now Sueoka Store was previously occupied by Mitsunami Store and the Bishop Bank. Mitsunami Store did not survive long and in 1927 Mankichi Sueoka leased Mitsunami’s space from Dr. Waterhouse. The Bishop Bank was renamed First Hawaiian Bank and moved down the street in 1935 and Sueoka took over the whole building. He purchased the property in 1943 and improved the building. The 1920s architecture that remains is interesting. The false front is distinguished by an articulating ogee curve and angled top, and a corrugated metal canopy is cantilevered over the sidewalk. 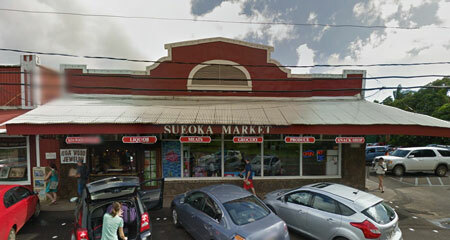 Sueoka Store is the only privately owned business on the Kōloa Road frontage.